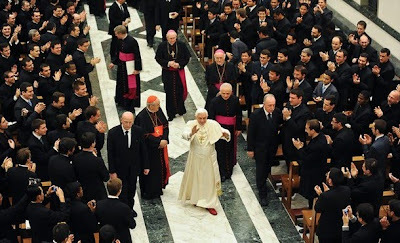 Over the weekend, B16 made his annual visit to Rome's major seminary on its patronal feast of the Madonna della Fiducia, known in English as Our Lady of Confidence. 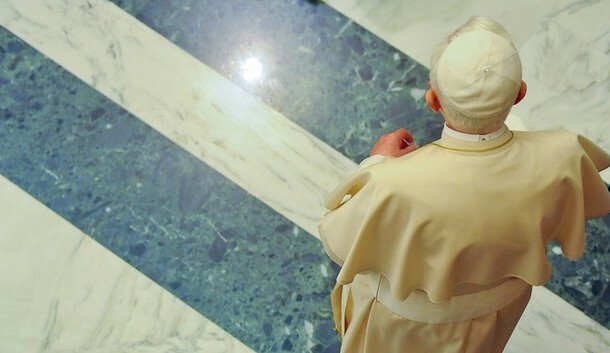 Keeping with his custom for the yearly trip, the Pope led the students in lectio divina -- the traditional close-reading of Scripture of which Benedict once said that "if it is effectively promoted, this practice will bring to the church -- I am convinced of it -- a new spiritual springtime." 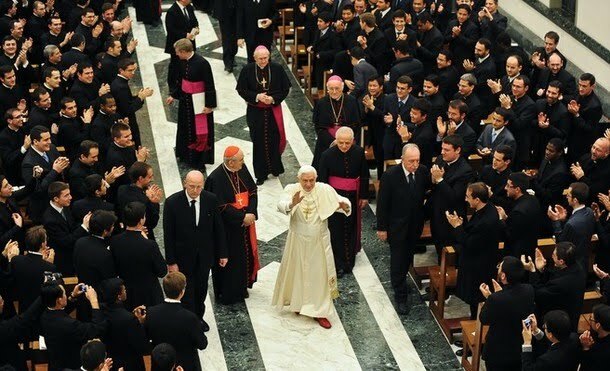 This time around, speaking off the cuff, the pontiff took Ephesians 4 as his text, sparking a meditation on the "body" of the church and the Christian vocation all-around that's particularly striking... especially as every vocation (read: the lot of us) comes in for its annual Lenten tune-up. Now we enter into the heart of our meditation, encountering a word that strikes us in a particular way: the word "call," or "vocation." 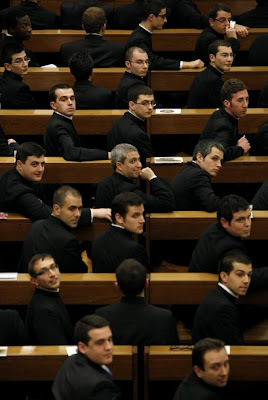 St. Paul writes: "conduct yourselves in a manner worthy of the vocation to which you have been called" (4:1). And he will repeat it shortly afterward, affirming that "there is a single hope to which you have been called, that of your vocation" (4:4). At this point we must remember that we are not speaking of people of the past. God, the Lord, has called each of us, he has called each one by name. God is so great that he has time for each one of us, he knows me, he knows each of us by name, personally. It is a personal call for each of us. I think that we must meditate on this mystery often: God, the Lord, called me, calls me, knows me, awaits my response as he awaited Mary's response, as he awaited the response of the Apostles. God calls me: this fact should make us attentive to God's voice, attentive to his words, to his call for me, to realize this part of salvation history for which he has called me. In this text, then, St. Paul indicates to us a concrete element of this response with four words: "humility," "meekness," "magnanimity," "being patient with one another in love." Perhaps we can meditate on these words in which the Christian journey is expressed. We will return in the end, once more, to this. "Humility": the Greek word is "tapeinophrosyne," the same word that St. Paul uses in the Letter to the Philippians when he speaks of the Lord, who was God and humbled himself, made himself "tapeinos," and descended to the point of making himself a creature, to the point of making himself man, to the point of obedience on the cross (cf. Philippians 2:7-8). So, humility is not just any word, just any modesty, but a Christological word. Imitating the God who comes down to me, who is so great that he becomes my friend, suffers for me, and dies for me. This is a humility to learn, the humility of God. It means that we must always see ourselves in the light of God; thus, at the same time we can know the greatness of being a person loved by God, but also our littleness, our poverty, and this is the right way to conduct ourselves, not as masters, but as servants. As St. Paul says: "We do not intend to be the masters of your faith; we are instead helpers of your joy" (2 Corinthians 1:24). Being a priest implies this humility, more so than being a Christian does. "Meekness": in the Greek text is the word "prautes," the same word that appears in the beatitudes: "Blessed are the meek for the earth shall be theirs" (Matthew 5:5). And in the Book of Numbers, the fourth book of Moses, we find the statement that Moses was the most meek man in the world (cf. 12:3), and, in this sense, he was a pre-figuration of Christ, of Jesus, who says of himself: "I am meek and humble of heart" (Matthew 11:29). This word too, "meekness," "sweetness," is a Christological word and again implies this imitation of Christ. Because in baptism we are conformed to Christ, we must therefore conform to Christ, find this spirit of being meek, without violence, of convincing with love and with goodness. "Magnanimity," "makrothymia" means generosity of heart, not to be minimalists who give what is strictly necessary: Let us give everything we posses, and we will also grow in magnanimity. "Being patient with one another in love": Supporting one another in our own otherness is a daily task, and especially when we support each other with humility, learning to truly love. And now we take a step forward. After this word of the call, the ecclesial dimension follows. We have now spoken of vocation as a very personal call: God calls me. He knows me, He awaits my personal response. But, at the same time, God's call is a community call, it is an ecclesial call, God calls us in a community. It is true that in this passage on which we are meditating, the word "ekklesia" -- "Church" -- is not there, but the reality appears that much more. St. Paul speaks of a spirit and a body. The spirit creates the body and unites us in one body. And then he speaks of unity, he speaks of the chain of being, of the bond of peace. And with this word he refers to the word "prisoner" from the beginning: it is always the same word, "I am in chains," "chains will fasten you." But behind this is the great invisible, liberating chain of love. Body: the Church is body, hence it has a structure, and also really has a law and at times it is not so simple to insert oneself. Of course, we want our personal relationship with God, but the body itself does not please us. But precisely in this way we are in communion with Christ: accepting this corporeity of his Church, of the Spirit, who incarnates Himself in the body. And on the other hand, often perhaps we feel the problem, the difficulty of this community, beginning with the concrete community of the seminary and ending with the great community of the Church, with its institutions. We must also keep present that it is very beautiful to be in company, to walk in a great company of all the centuries, to have friends in Heaven and on earth, and to feel the beauty of this body, to be happy that the Lord has called us in one body and has given us friends in all parts of the world. Now we can take a further step forward. If we ask ourselves what is the profound meaning of this use of the word "call," we see that it is one of the doors that opens to the Trinitarian mystery. Up to now we have spoken of the mystery of the Church, of the one God, but the Trinitarian mystery also appears. Jesus is the Mediator of the Father's call which comes in the Holy Spirit. The Christian vocation cannot but have a Trinitarian form, whether at the level of the individual person or at the level of ecclesial community. The mystery of the Church is altogether animated by the dynamism of the Holy Spirit, which is a vocational dynamism in a wide and everlasting sense, beginning with Abraham, who first heard the call of God and responded with faith and action (cf. Genesis 12:1-3); to the "here I am" of Mary, perfect reflection of that of the Son of God, at the moment that she receives from the Father the call to come into the world (cf. Hebrews 10:5-7). Thus, in the "heart" of the Church -- as St. Therese of the Child Jesus would say -- the call of every individual Christian is Trinitarian mystery: the mystery of the encounter with Jesus, with the Word made flesh, through which God the Father calls us to communion with himself and because of this wishes to give his Holy Spirit, and it is precisely thanks to the Spirit that we can respond to Jesus and to the Father in an authentic way, within a real, filial relationship. Without the breath of the Holy Spirit the Christian vocation can simply not be explained, it loses its vital lymph. And, finally, the last passage. The form of unity according to what the Spirit asks, as I said, the imitation of Jesus, conformity to him in the concreteness of his behavior. The Apostle writes, as we meditated: "with all lowliness and meekness, with patience, forbearing one another in love," and then he adds that the unity of the Spirit is maintained "in the bond of peace" (Ephesians 4:2-3). The unity of the Church is not given by a "stamp" imposed from outside, but is the fruit of concord, of a common commitment to behave like Jesus, in the strength of his Spirit. There is a comment of St. John Chrysostom on this passage that is very beautiful. Chrysostom comments on the image of the "bond," the "bond of peace," and he says: "[t]his bond is beautiful, with which we are bound together with one another and with God. It is not a chain that wounds. It does not give cramps to the hands, it leaves them free, it gives them ample space and greater courage" (Homily on the Epistle to the Ephesians 9, 4, 1-3). Here we find the evangelical paradox: Christian love is a bond, as I said, it refers us to the situation of St. Paul, who is "prisoner," who is "in chains." The Apostle is in chains because of the Lord, as Jesus himself, who made himself a slave to free us. Speaking of lectio divina, the Anglosphere's best known keeper of the craft, Archbishop Tom Collins of Toronto -- who leads the "divine reading" monthly in his cathedral -- recently rolled out a new book on the practice, Pathway to Our Hearts, its reflections rooted in the Sermon on the Mount. In an exceptional testament to the volume's caliber, the book's been warmly praised by no less formidable a Stateside duo as the archbishop of Denver and the bishop of Tucson. And, suffice it to say, anything that sees those two in agreement is pretty much a monument in itself.